A high-fat-diet-induced immune reaction causes inflammation leading to intestinal cancer in a mouse model – even among animals that are not obese—according to a new study from the Perelman School of Medicine at the University of Pennsylvania, Case Western Reserve University, the Pacific Northwest Research Institute (PNRI), and others. Epidemiological and clinical evidence have linked obesity with inflammation and increased risk of cancer. Up to now, however, the molecular mechanisms linking these three conditions have been elusive. 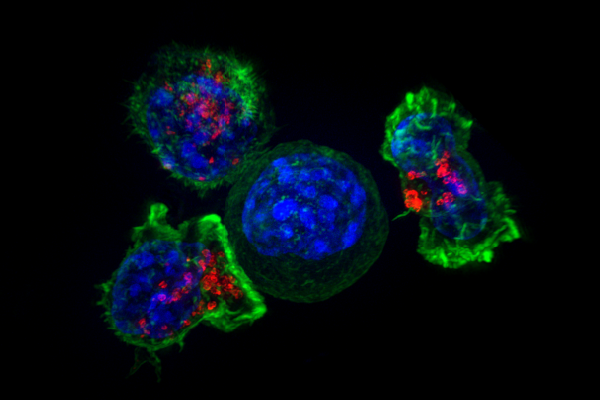 The interdisciplinary team published their findings in Molecular Cancer Research. "We found that specific types of high-fat diets – based on corn or coconut oils like those found in certain salad dressings and ice cream—are associated with increased tumor formation in a mouse model of intestinal cancer," said co-senior author John Lambris, PhD, the Dr. Ralph and Sallie Weaver Professor of Research Medicine at Penn. "This model is particularly interesting because it resembles human familial adenomatous polyposis, a condition that carries an 80 percent risk of developing colorectal cancer in individuals with mutations in a tumor suppressor gene called Apc." While increased tumor formation was associated with mice fed corn or coconut fats, mice fed diets with olive oil as a source of fat did not develop intestinal polyps, despite being obese. "This observation led us to our first important conclusion that diet, but not necessarily obesity, can promote intestinal cancer," said co-author Edimara Reis, PhD, a research associate in the Department of Pathology and Laboratory Medicine. In fact in late September, the FDA decided to give the food industry three years to phase out partially hydrogenated oils, the main source of trans fat in some foods based on corn oil and other types of fat. Using the mouse model, which was developed by co-senior author Joseph Nadeau from PNRI and first author Stephanie Doerner from Case Western, the team concluded that a high-fat diet (rather than metabolic status) and the chemical composition of the diet are the most important factors for determining cancer risk. "Our results clearly show that eating a high-fat diet is sufficient to increase cancer risk, regardless of obesity," said co-senior author Nadeau.The team also noted that tumor formation was caused by inflammation induced by the corn- and coconut-based diets. Notably, inflammation and intestinal tumors in the mice were triggered very soon – three days—after being fed these high-fat diets. "When mice were given a drug to reduce the activity of C5aR, it prevented the development of intestinal tumorigenesis in mice fed corn- and coconut HFDs, indicating that anti-complement therapy could act as an adjuvant with cancer treatments," Lambris said. The team also surmises that a diet change and complement inhibitors could potentially be beneficial to people with the apc mutation to prevent carcinogenesis. The team is now working on understanding the exact biochemistry of how certain HFDs activate complement with the production of the C5a molecule. This work was funded by the National Institutes of Health (U54 CA116867, AI030040, AI068730, P40 RR012305).